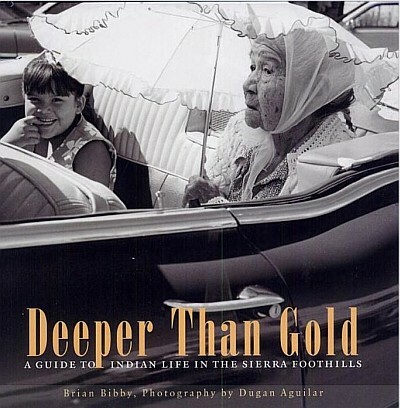 In 2005 Heyday Press released a book called “Deeper than Gold; A Guide To Indian Life in the Sierra Foothills”, authored by California ethnologist Brian Bibby. Brian Bibby’s books are mainly about the life of California Native Americans, their basketry, their music, and their life ways. 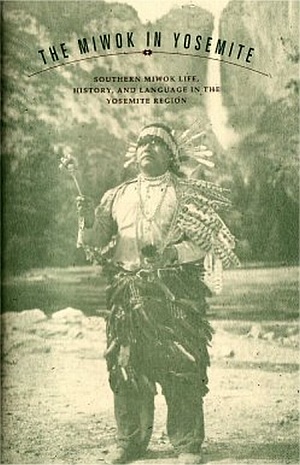 Bibby’s book, “Deeper than Gold”, contained stories of the California Indian people who lived on the western side of the Sierra Nevada foothill communities. In Bibby’s book he had a section about the American Indian Council of Mariposa, also known as the Southern Sierra Miwuks. On pages 162 through 166 was a short biography of Chief Bautista and he was described as the patriarch and the last recognized captain of the Miwok people of Mariposa. He was reportedly their most important captain of the Southern Sierra Miwuk people who are now claiming to be part of Chief Tenaya’s Yosemite Ahwahneechees. In this article we will examine important parts of Bautista’s biography that were left out concerning this important chief of the Mariposa County Miwok Indians. Bautista went by other names in his lifetime. He went by Vowchester, later on as Robert Howard, but his earliest name was Keechee. 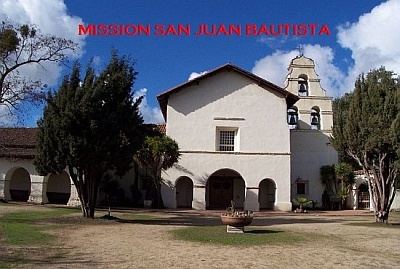 Stories say that when Bautista was wounded and captured as a child in 1812 by a Spanish regiment led by Vallejo in the tule areas surrounding San Juan Bautista. The Spanish had captured Keechee in a skirmish with Indians who were stealing horses from the local rancherias. In the skirmish Keechee’s father was killed. Keechee was reportedly taken and raised at Mission Bautista and became a baptized neophyte. There Keechee was given the name Bautista and also learned to speak Spanish. Bautista reportedly married a woman from another tribe called the Potoyencee, and he was supposed to be from the Luttasme tribe. San Juan Bautista Mission stands today. Mexico gained independence from Spain in 1821 upon conclusion of a decade-long war of independence so California became part of the new country of Mexico. Then the Mission system started to fall apart. Around 1840 Bautista and his family left the Mission and went to the homeland of his wife’s tribe around Lake McClure in western Mariposa County. A weakened Mexico opened up settlement to new comers. At that time many “Americanos” had settled in the area and were starting to have closer ties with the expanding United States that they originally had come from. Many of the white settlers had San Joaquin Valley Indians working for them and many of the Indians felt they were treated better then the Spanish did on their rancherias. People like Sutter, Johnson and Webber had made friends and contacts with many of the tribes of the San Joaquin Valley. So when the United States wanted to expand the white settlers asked and received help from the California tribes when the Americans started a war to take California from a weakened Mexico. Then in January of 1848 gold was discovered in Colusa. A month later California was now part of the United States. The area started flooding with people coming from all parts of the world to mine gold in California. The miners were quickly moving into areas where the Indians had gone previously unmolested. Charles Webber, the founder of Stockton, used his influence with chiefs to get their people to dig gold for him in exchange for provisions. Around the same time was this very enterprising young blonde man by the name of James Savage who had come to California to make his fortune. As the whites pushed into the foothills in search of gold Savage ran into a very unfriendly Chief Bautista and his band of Potoyencee. The tribes in the area had been a bother to the new expanding settlers and gold miners. But the wily Savage had convinced Bautista and his men that he could not be killed. There was a story that Savage had tricked Bautista and his band by placing blanks in a gun and had one of them fire at him. They were amazed that he did not die and Savage made an alliance with Bautista and other chiefs in the area. Bautista and other chiefs in the Southern Mines area started to work for James Savage. 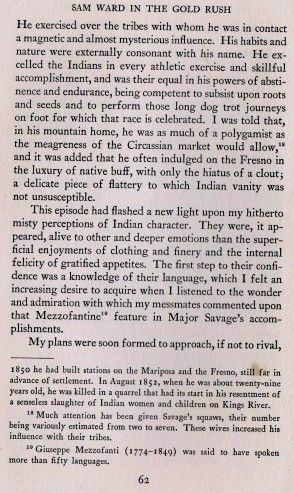 James Savage learned the Southern Sierra Miwuk language from Bautista and his band. Bautista and some of other of chiefs gave James Savage many of their tribe’s young girls in marriage. It was reported that Savage had up to seven to twelve wives from the western foothill tribes, including Bautistas. The girls ranged from ages 12 to in their teens. Savage then received the title of the “Blonde King of the Indians”. Pages 62 - 62 from Sam Ward in the Gold Rush discussing Mariposa Battalion's James Savage and Bautista. Savage learned the Miwok language and even spoke the chiefly language. Savage had promised his Indian ‘subjects’ that in exchange for them working for him digging gold he would give them provisions of food and blankets. James Savage became wealthy with their labor and opened up a trading post. Then with all the gold he made Savage and Chief Bautista went to San Francisco in the summer of 1850. Savage had told whites in the area that he was now rich and could now afford a beautiful white wife in San Francisco. In San Francisco James Savage went on a gambling and drunken spree instead of buying provisions for his Indian workers. Meanwhile Bautista was dumbfounded and astounded at the sight of the city of San Francisco, which had grown into a large city in a short quick time. Bautista had never seen such a sight. Bautista later told the other Indians that it was futile to fight the whites because he had seen for himself that there were thousands of them while visiting San Francisco. Many whites flocked around Savage and Bautista because many whites had never seen a real life Indian up close. Reports say that Bautista relished the attention. They even dressed him up in a military outfit and took pictures of Bautista. At the same time James Savage had spent all the money he had earned from the labor the Indians on drinking, brothels and gambling until he was broke. Now without any money Savage and Chief Bautista returned back to Mariposa County. There Savage happily called upon all the chiefs and gathered them up all together to tell them what a glorious time he had living it up in San Francisco. As James Savage told the Indians of his exploits in San Francisco one of the chiefs got up and with a look of disgust told Savage that they had been tricked and fooled by him. The surprised Savage struck the chief who had the courage to confront him. Then the chief got up and with some of the other chiefs left with their people. Bautista went with them. He knew he had to go or the other chiefs would have killed him. Savage continued on his enterprise with his trading post and later reconciled with Chief Bautista. At that time miners who had been venturing up closer to the mouth of Yosemite were attacked and killed. Indians were making nightly raids on miner’s camps and settler’s homes. Then in December of 1850 Indians raided and burnt down James Savage’s trading post. The U.S. government came to James Savage and asked if he could quell the Indian raids because they were disrupting the gold miners and the pioneer settlements. They wanted Savage to get all the Indians to come in and sign a peace treaty and agree to live on the reservations where they could be monitored, but well fed and taken care of. So Savage called upon his old friend Chief Bautista, with other friendly chiefs Cypriano, and Cornelius to see if they could call upon the other foothill tribes to come in and sign the treaty and agree to the conditions of the U.S. government. Bautista, Cypriano and the other peaceful chiefs agreed and signed the treaty, but Bautista said that two tribes would not come in and sign. One was the Chowchillas, who were one of the tribes who had a spat with Savage. The Chowchillas lived to the southeast of their location. The other was a tribe that Bautista had little contact with. In a Stockton newspaper Bautista described this tribe as “Monahs” who were from the eastern side. Bautista and his people were afraid of these people who lived in a valley of stone. Bautista called these people the “Yosemites” and that they were a very powerful and feared tribe, and his people never ventured into their area. Lafayette H. Bunnell also wrote this in his book the Discovery of Yosemite. In his book Bautista is also called Vowchester a broken English translation of Bautista. The rest is history. That is how Yosemite Valley was discovered. In reports of the flight of Tenaya and his people, Bautista reportedly sent some of his men to try to catch the Yosemite Ahwahneechees as they fled across the Sierra Nevada to Mono Lake for the U.S. military. Because of his service the military heaped praise on Chief Bautista and he became very powerful amongst the tribes in the foothills. He was now James Savage’s right hand man and would use his men to capture Indians who ran away from the gold mines. In one Stockton newspaper account Bautista in a drunken rage stabbed one of his wives in the head killing her, but the whites looked the other way because Bautista had become extremely useful in controlling the Indians of the area. Chief Bautista even became James Savage’s personal cook. In return James Savage became very close to Bautista and his people and became their protector. Savage made sure that the other whites did not bother or exploit them. Then one day a white man by the last name of Harvey wanted the land of the Indians that Savage had befriended. Harvey had shot a killed some of the Indians and frightened them off a section of their land. James Savage was so furious he went to visit Mr. Harvey and struck him. In response Mr. Harvey shot James Savage dead reportedly in self defense. When Bautista and the other Indians heard this they ran to the side of James Savage’s body and cried “our white father is dead”. They were so upset that people could not get close to James Savage to recover his body. Harvey had to leave town really quickly because Savage’s Indians were now looking to kill him. With James Savage now dead the Indian reservation that Bautista, Cypriano and the other chiefs had signed for was now being taken away by settlers. A man with the last name of Belt tried to get the government to keep their promise to feed the Indians but that fell on deaf ears. One of the last persons to try to help Savage’s Indians was a man named Captain W. J. Howard. W.J. Howard came to the area and saw the sad state of the Indian people of Mariposa County and tried to take care of them. At this time Chief Bautista went from Keechee, to Bautista to Robert Howard after W.J. Howard. The Howards took care of Bautista’s people and when they moved closer to Yosemite Bautista, now Robert Howard, and some of his people followed. Chief Bautista’s descendents were called the Howards. 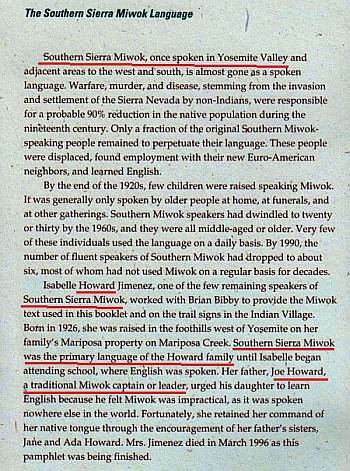 Booklet The Miwok in Yosemite sold in Yosemite National Park's bookstore and Indian museum mentioning the Howards as the leading Southern Sierra Miwuk family. Because Chief Bautista had been a friend to the whites and had assisted them for decades they never bothered him. Later on he and his people became part of the Mariposa community. Chief Bautista (Robert Howard) and his people were not the Yosemite Indians as books have claimed. They were James Savage’s Indians and you can see the proof on the photo. Chief Tenaya and the Mono Paiute Ahwahneechees had tried to fight off the whites and never agreed to sign anything giving up their homeland. All Chief Tenaya and his people wanted was to be left alone in peace in their serene Yosemite Valley home.